Dr. Rajat Sharma, MBBS, MD, DM(Cardiology), is a Cardiac Electrophysiologist in the department of Cardiology at Fortis Hospital, Mohali. He manages a regular Heart Rhythm Clinic, Heart Failure Clinic, Pacemaker & Device Clinic and Inherited Heart Disease Clinic at Fortis Hospital, Mohali. After completing his core cardiology residency from the premier Postgraduate Institute of Medical Education and Research(PGIMER), he pursued advanced fellowship in Clinical Cardiac Electrophysiology from University of Dalhousie, Canada. 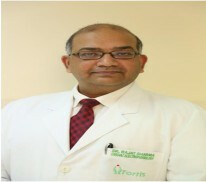 Dr. Sharma is the lead physician and heads the Heart Rhythm & Pacemaker Division at Fortis Hospital, Mohali. He specializes in the management of various cardiac arrhythmias or heart rhythm abnormalities. He performs cardiac electrophysiology studies (EP Study) and catheter ablation for the management of various cardiac arrhythmias. Biventricular pacemakers for heart failure patients and pacemaker troubleshooting. To his credits, he has over 100 publications in international journals, related to core cardiology & cardiac electrophysiology. He is currently a reviewer of prestigious cardiology journal (Cardiac Catheterization and Interventions). Over and above, Dr. Sharma is involved in few ongoing Heart Rhythm trials in Canada. He has delivered various lectures in various orations across the world.